The #xrayoftheweek is this AP view of the lumbar spine in someone with a chronic disorder and acute pain. What is the underlying disorder and what is the new complication? There are several classic signs on this xray of ankylosing spondylitis. This is a seronegative spondyloarthropathy which results in fusion of the spine and sacroiliac joints. On this xray, the SI joints are fused and cannot be clearly delineated. 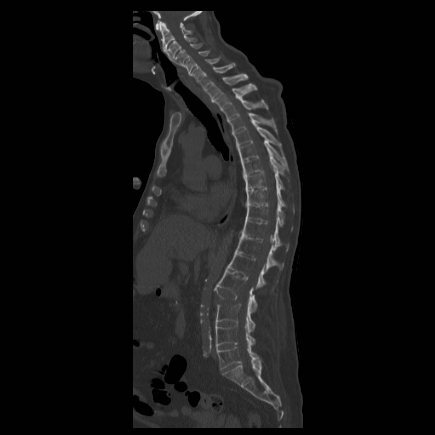 A fracture across the L3 vertebral body is shown, with a marked acute kyphosis at this level. The continuous ossification of the anterior longitudinal ligament running down the front of the vertebral column is broken. The rest of the vertebral column shows the "bamboo spine" sign due to flowing syndesmophyte formation (ossification of the edges of the intervertebral discs), and squared vertebral bodies. This fracture is known as a chalkstick or carrot stick fracture because of how brittle the spine becomes in ankylosing spondylitis. Fractures can occur with minimal trauma, and are usually at the cervicothoracic or thoracolumbar junctions.